The Spring weather is here, Low 80F’s with sun all of this week. I decided to celebrate and do the walk and then sit on “The Rock”,” Our Rock”,” Contemplation Rock” (you don’t have to contemplate, it’s a place to just Be). It seems that a special destination deserves a special name. I slipped on my VFF KSO’s, so I was feeling the more barefoot experience on this walk, as I continued. I notice the amount of prickery things that have blown back onto the trail. I do notice a few chewed prickly pear cactus. This could mean any of many critters, but then an arm/pad that I had hacked off and thrown off of the trail had made it back to the middle of my route. This wasn’t any rodent. This was too heavy for one to move. I proceed, but notice no tracks. The surface is hard. It is rocks and it is dry. I have swept the sandy area and this should give me clues, but none materialize. I arrive at THE Rock; I mount it and lay back. I listened to the constant buzz, the sounds of early spring. I also hear a strange noise in the little valley, next to me. Then, that noise again. It might be a woodpecker, but it is a bit quiet. 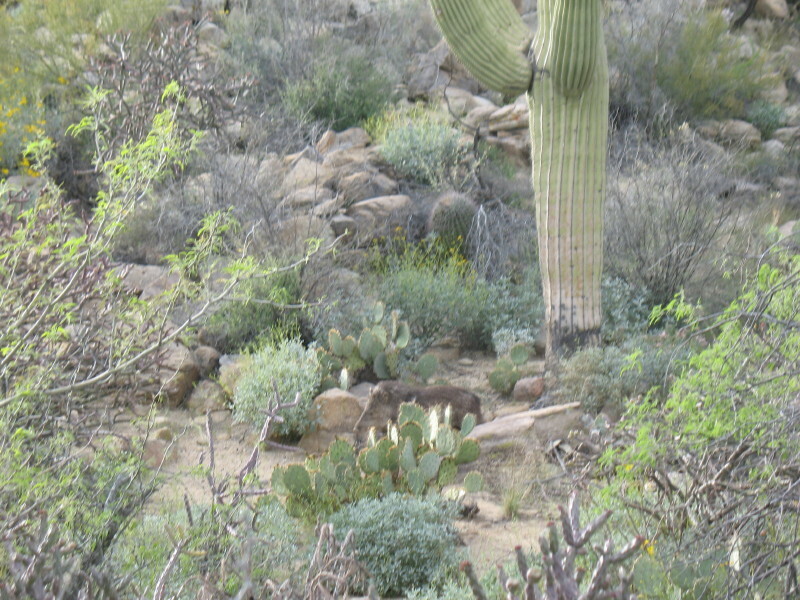 I haven’t heard any woodpeckers tapping at saguaros lately. I figure they are a seasonal activity. I spend my time, noticing the temperature of the rock and the comfortable breezes passing by. I finally stand up and survey. 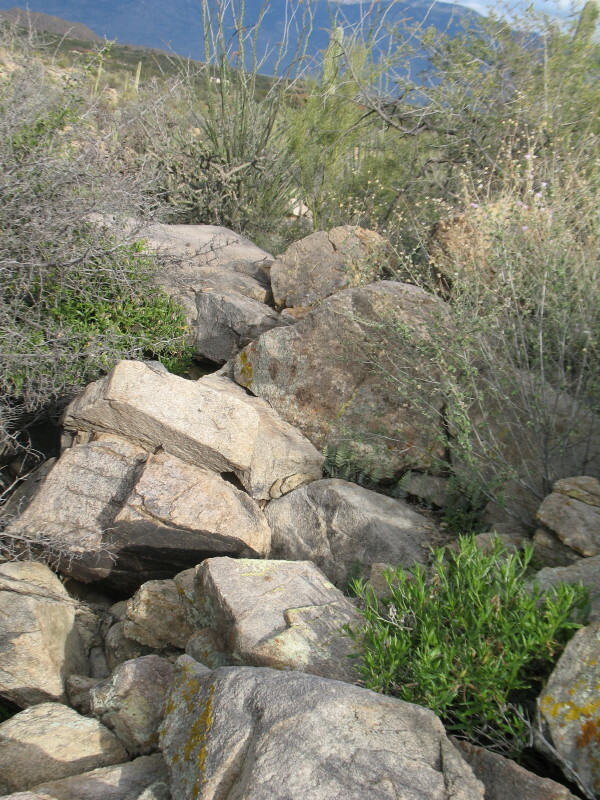 The trail currently passes through 30 to 40 feet of exposed area. I could make it better, more clandestine. There is a way to step through, on top of the other boulders strewn in a formation with THE Rock, but going the other direction. I had been ignoring it, contemplating the possibility of a rattler encounter in the crevasses. I see a clear area past that. I carefully step through, reassessing the passage. It is possible to stay high enough to most likely avoid the mentioned possible hazards. My route links up to a clear area and then meets with my current trail on the other side of the ridge. Perfect. I’ll trim back one prickly pear and I’m good. The rocks that lead away. I decide to double check the footing and return to my rock. One of the boulders has had my suspicions and I confirm that putting my weight on the opposite end makes a wobbling of the block shaped piece of granite. This wobble produces a noise and then the noise produces a commotion about 40 feet away. I hear the snort. It’s a pair of javelina males. From my perch, I can see the movement. Then they appear clearly. Also, I see a mother with a young one, which is still following her. I move to better vantage, and see even more appear. They just keep appearing. There are at least ten. Two mothers with young, and some big fellows. Once before, I had passed deeksha (an unconditional calm energy, a sense of oneness) toward a mother and infant and they then immediately stopped their frightened flight, which was caused by the naked one, me, startling them. I try that again. It seems to work. They just begin immediately, to browse comfortably. The alarm disappeared with uncanny timing. I’m pleasantly stunned. I stand there watching for probably twenty minutes. It occurs to me that in acquiring this hidden spot, I have put myself in a great place where others hide safely. First, there had been the deer and now this. Sitting quietly on that rock will bring me natural surprises, as we both find our seclusion. I have to bring the broom and shovel out to clear just a tad more this week in the exceptional weather and learn more about that loose rock. As I return for this chore, the evidence mounts that the javelina are also using the stealth trail that I have cleared.